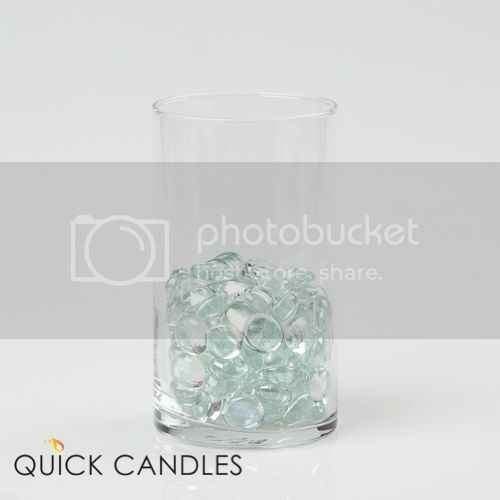 Eastland Clear Glass Flat Gem Vase fillers single container consists of 1 pound of filler, approximately 120 pieces. Each flat marble is .5" in diameter. The single container will fill the 6" cylinder vase to the level shown in the photograph. To reach your desired level in a vase or container, you may be able to fill more than one vase with a single container, or purchase more containers to achieve a higher level of filler. Flat glass gems are reusable and come in a convenient container for storage. One container can fill the bottom of our cylinder and square vases to add color and texture to your design.